This Sonneberg Museumsbear is made of the finest Mohair and stuffed with traditional Excelsior filling, pull-growler voice. 14.25 inches tall. He holds a Miniature Mohair Bear 5 inches tall, in his arms. The Sonneberg Museumbear is based on a bear that can be seen in the German Sonneberg Museum. Hermann-Spielwaren GmbH write about The Sonneberg Museum Bears:" The Sonneberg Toy Museum is one of the oldest toy museums in the world. In the possession of this museum there are some old Max Hermann Teddy Bears, given to the museum in the 1920s and 1930s by Hermann to preserve them for posterity. Since 1994 Hermann have designed a special bear for the museum every year and presented the number 001 of each model to the museum." HERMANN- Spielwaren GmbH, Coburg, Germany create beautiful Mohair teddy bears in Coburg, Germany in the traditional style. 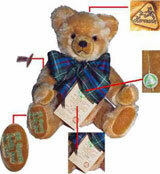 One of the oldest still existing Teddy Bear companies in the world, they were founded in 1920 in Neufang near Sonneberg, Thuringia. The bear with the running dog with certificate of authenticity. Sizes: 14.25 inch and 5 inch. A Limited Edition of 100 pieces.